Well if you are reading this you are either suffering from the symptoms of trainer psychosis or very curious about the title of the article. When I say trainer I am talking about that piece of equipment all serious and competitive cyclists use to stay fit or to improve their performances. These trainers are self-prescribed by athletes or by their coaches for off-season training in colder climates. This dastardly piece of equipment is often a necessary evil, but after about 6 weeks of using said trainer it becomes a spiteful, boring, tormentor and hated piece of equipment for all but the most twisted of cyclists. The trainer is trying to break my beautiful carbon fiber frame. I can hear it! Such as I bet watching TV might be more productive use of my time and I hope this next interval doesn’t break my legs. All kidding aside many of us are stuck in the basement, garage or our “Pain Caves” knocking out mile after mile going nowhere. I promise it will be worth it especially if you are consistent in your training. Is there relief from this dreaded condition? Absolutely! Switch to rollers. Having multiple methods of training in the colder months can really help you break up the monotony. Ride outside. Yeah I realize it’s cold, wet, snowy and even windy but it’s possible to ride out doors in the winter. With in reason. My cut off temperature is 30*F. I realize there are many readers and athletes I coach tougher than that but that is my threshold! Break out the Mountain or Cross Bike. Dealing with snow can be a blessing in disguise for road cyclists. This time of the year many road going cyclist will hang up their bikes and break out their Mountain and Cross bikes to ride frozen trails and gravel fire and or logging roads. This can be great way to work on bike handling skills and improve your anaerobic power. While all the while keeping us connected to mother nature. Get off the bike. 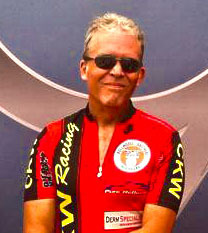 I am not saying it’s necessarily time to get off the bike but I am saying to look into some auxiliary training. Core, strength, flexibility and even running can benefit cyclists. A strong core will really improve your performance in many aspects of your cycling. Being more flexible will help you sustain a flatter back on your road and TT bikes longer. Strength training can improve body composition as well as muscle endurance and pedal force. Running can help to lower your resting Heart Rate and push up your Max Heart Rate all the while burning more calories in a shorter period of time then you can on the bike. Not happy with your trainer? Get a new one! 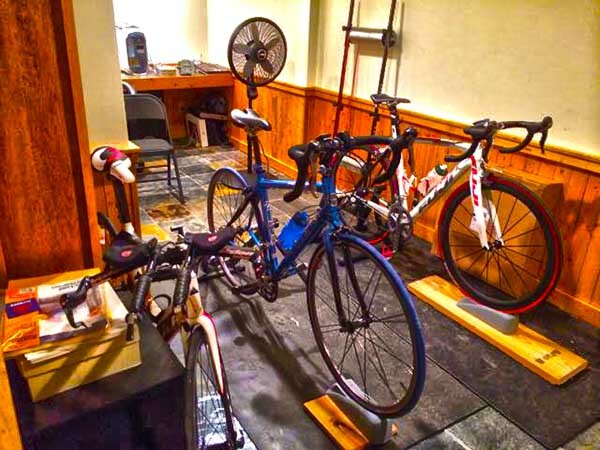 There are so many options on the market today from your basic magnetic trainer, fluid trainer, VR trainers and the new direct drive trainers from Lemond and Wahoo Fitness. The VR trainers and better yet the New Kickr trainer from Wahoo Fitness allow you to ride in Virtual Reality rides and Races. The Kickr is also being considered an ergometer as it has a true strain gauge built in for accurate and repeatable power measurements. I have several articles that you may find helpful on the subject of trainers and off-season/winter training. Many of them including trainer specific workouts. Check them out! Are you suffering from Trainer Psychosis? Stop by our Facebook page and tell us about it. Pain shared is pain lessened.